HARARE, Zimbabwe — Euphoric crowds of several thousand people flooded the streets of Zimbabwe’s capital on Saturday to demand the departure of President Robert Mugabe after nearly four decades in power. In a colorful gathering that even days ago would have drawn an immediate police crackdown, Zimbabweans giddy with joy raced through intersections, raising their arms in triumph. Young men shouted, laughed and embraced. Others danced on top of moving buses. Some had posters with an image of the military commander who swept in earlier this week and put Mugabe under house arrest, with the slogan: “Go, go, our general!! !” Marchers handed flags to soldiers, who accepted and waved. “It’s like Christmas,” said another marcher, Fred Mubay, who said Zimbabweans have been suffering for a long time. Mugabe, the only ruler Zimbabwe has known since independence from Britain in 1980, has been holed up in his lavish ‘Blue Roof’ compound since Wednesday, from where he has watched support drain away from him in the wake of a military seizure of power. The 93-year-old, who is the world’s oldest head of state, is said to be asking for more time amid negotiations with regional leaders who seek his exit with a veneer of dignity. But he is virtually powerless and deserted by most of his allies, with others arrested. The ruling party has also turned on him, asking for a Central Committee meeting this weekend to recall both him and his wife. Impeachment is also a possibility when Parliament resumes Tuesday. But as crowds flooded the streets Mugabe's nephew, Patrick Zhuwao, warned that Mugabe has no intention of stepping down in order to legitimize this week's military coup. Mugabe and his wife Grace are "ready to die for what is correct," he said, adding that his uncle had hardly slept since the military seized power on Wednesday but that his health was otherwise "good." The dancing crowds in Harare were making it clear the country is impatient to move on without Mugabe, who took power 37 years ago amid an air of optimism but has been accused of squandering the once-prosperous country’s potential. Mugabe’s downfall is likely to send shockwaves across Africa, where a number of entrenched strongmen, from Uganda’s Yoweri Museveni to Democratic Republic of Congo’s Joseph Kabila, are facing mounting pressure to step aside. Even as concerns remained about who next would be in charge and what freedoms might be available if the military lingers in power — or if Mugabe’s recently fired deputy leads a new government — people reveled in the rare chance to speak out. 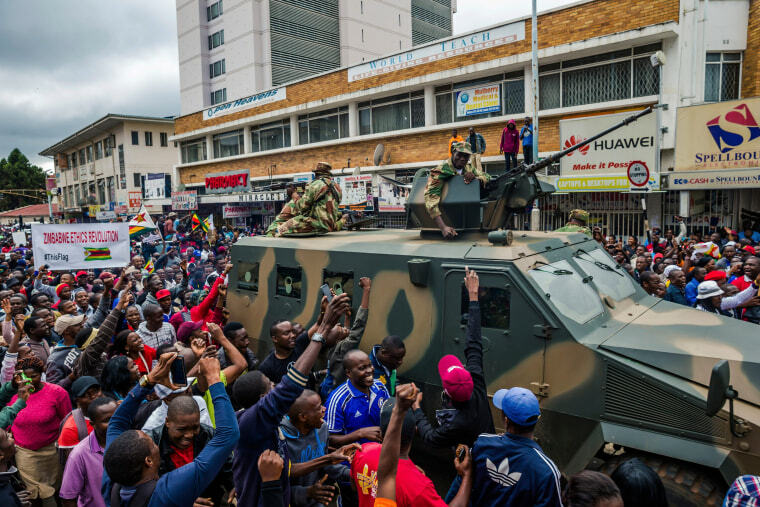 The demonstrators, in the event approved by the military, hoped a big turnout would speed up the official end of Mugabe’s rule, which is widely blamed for the collapse of an economy that was once one of Africa’s wealthiest. The majority of adult Zimbabweans now survive on informal trade after formal industry collapsed. Veterans of the long liberation war against white minority rule, at one time close allies of Mugabe, took part in the demonstration, along with opposition activists who have long faced police crackdowns by the Mugabe government. Outside Mugabe’s official residence, the State House, a place few previously dared venture, soldiers posed for pictures as marchers streamed by. Harare’s Robert Mugabe Street turned into a carnival. Drivers gunned their engines, blasted their horns and circled in a main intersection, enveloping the crowd in exhaust fumes. Some white Zimbabweans joined the crowd at Harare’s Freedom Square, also known as Robert Mugabe Square. Some whites and blacks hugged each other. Soldiers began approaching the demonstrators and urging them to head to the Zimbabwe Grounds, where speeches were set to be delivered. The state-run broadcaster said it would air them. Related: Did China have a hand in military plot against Mugabe? The Zimbabwe Grounds were chosen for the symbolism. The location is where Zimbabweans gathered to cheer Mugabe’s return from exile in 1980 after the liberation war from white minority rule. Now the crowds wish to meet there and urge Mugabe’s departure. The 37-year-old Talent Mudzamiri was born soon after Zimbabwe’s independence.